‘FODMAP’ stands for fermentable oligosaccharides, disaccharides, monosaccharides and polyols a set of sugars found in many fruit, vegetables, grains and dairy products. Some members of this group might be familiar to you already. Lactose, for instance, is found in milk, and fructose, in many fruits and vegetables. You may also have heard of sorbitol, sometimes used as a substitute for cane sugar, sometimes used as a laxative. There are several more sugars falling into the FODMAP set. These sugars are grouped together because of what they do in your gut rather than because they share the same structure. So what do FODMAPs do? FODMAPs are poorly absorbed by the small intestine and rapidly fermented by the bacteria that live there. They can also increase the amount of liquid in your small intestine, making what’s in there too liquid. That can make it difficult for your gut muscles to push the load through your system, causing diarrhea. That’s the case for all of us. Most of us might notice that as flatulence after certain foods or a loose stool next time you go to the toilet. For some of us though, FODMAPs can trigger painful or uncomfortable symptoms. An uncomfortable feeling of being bloated and perhaps a visibly distended belly. Also pain, nausea and diarrhea or constipation. It’s not. Gluten is a protein found in grains such as wheat, rye and barley. For some people gluten can trigger symptoms like those described here. The first thing to point out, perhaps counter-intuitively, is that FODMAPs are not the cause of your symptoms. FODMAPs, along with stress or not enough exercise, are triggers that set them off. Something will be causing those symptoms though so we strongly recommend you see your doctor and thoroughly go through the possibilities. The reason is that there are some serious diseases that can cause those symptoms, which you may need medicine or other treatment for—addressing the symptoms and the triggers will not be enough. It may not be possible to identify that you have a particular disease or disorder. This is not necessarily a failing of the doctor. And it doesn’t mean there is nothing wrong. It just means the tests available now do not show the signs of anything that would cause those symptoms. You should do these tests so that you at least rule out that you have certain diseases—some of them can be serious. This fact sheet lists some tests currently available. In the meantime you can still look at ways to manage the symptoms through diet, exercise and managing stress. What about irritable bowel syndrome? If a disease cannot be identified then your doctor or specialist may tell you that you have irritable bowel syndrome (IBS). IBS is a term for a characteristic set of symptoms like those outlined above. The causes of the syndrome are not known. The Victorian Government’s Better Health Channel has an excellent fact sheet on IBS which we recommend. You may also hear the term ‘functional gastro-intestinal disorder’ (FGID). The term is used when it is clear that the usual functioning of your gastro-intestinal is impaired in some way but without it being possible to identify anything abnormal in blood tests, endoscopy or x-rays. A low-FODMAP diet has been found to be one of the most effective ways to manage the symptoms described here, whatever is causing it—more effective than anything that could be prescribed. In fact it’s a rare case of there being robust evidence to support change of diet. Meditation, breathing exercises and physical exercise can also be very effective in controlling some of the other triggers, such as stress or tiredness. A low-FODMAP diet will exclude or restrict those foods that are high in FODMAPs and include more of those foods that are low in FODMAPs. A well-designed diet should balance control of your symptoms with enough variety so you get the nutrients, fibre and pre-biotic foods you need to be healthy and enjoy your food again. 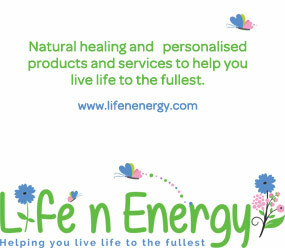 It will also be specific to you, only restricting what is necessary to control your symptoms. What are low- and high- FODMAP foods? 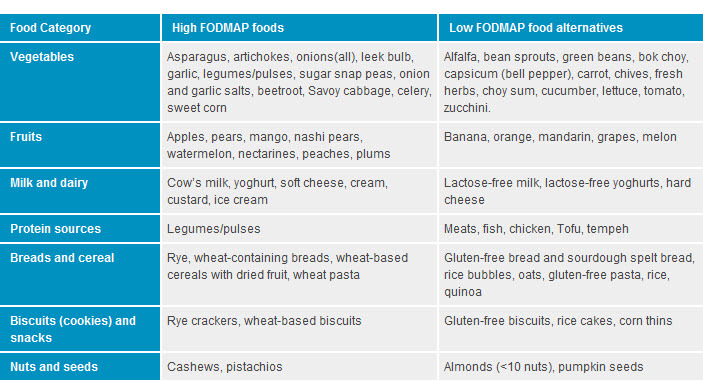 This table taken from the website of Monash University’s Department of Gastroenterology 21st October 2014, gives you examples of high- and low- FODMAP foods as they are currently understood. We should point out though this research in this field is new and constantly evolving, so this list is up-dated by the university. We recommend their low-FODMAP diet app which is an up-to-date list of high-FODMAP foods and their alternatives. How restrictive do I have to be? Everyone is different so there is no general answer. The way to find out, in detail, is to record what you eat and your symptoms (plus some other information) in a food journal. You can also do a breath test for hydrogen and methane. The test will tell you if two sugars in particular, fructose and lactose, are not being absorbed. The value of doing the test is that it can help you home in on some foods in particular that can trigger symptoms. Once you know what you can’t eat you can start thinking about what you can.